Having your love story recorded on film is one of the best ways to remember your cherished day forever. 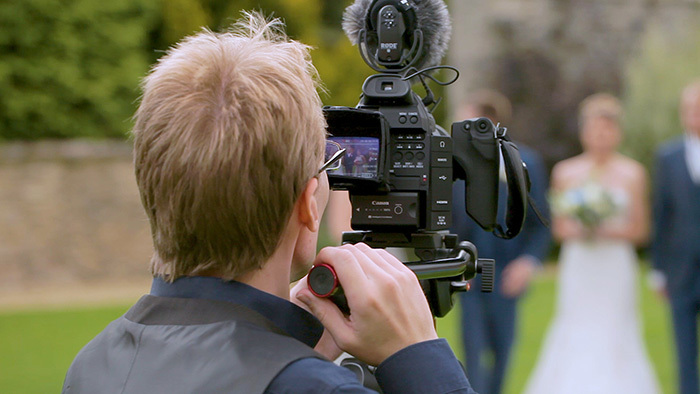 We’re big fans of natural wedding cinematography and let the happiness and emotions of your day pour into our films. All of your wedding day’s special moments will be captured by our two camera operators so that you can experience them over and over again. Subtle microphones are used to capture crisp sound from your ceremony and wedding breakfast speeches. After all, those shocking stories from the best man need to be preserved in all their glory! Your wedding film is then edited with our unique cinematic style, making it truly mesmerising and unforgettable. “We’ve just watched it – OH MY GOSH!! What you’ve done is AMAZING!!! & send us an enquiry.